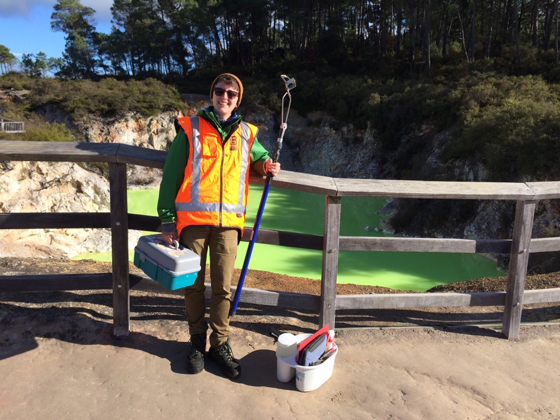 I’m in my fourth week here in the Taupo Volcanic Zone of New Zealand on my quest to understand what eukaryotic life –especially protists– can thrive in hotsprings. A quick refresher: protists are single-celled microbial eukaryotes and include many diverse lineages like amoebae, ciliates and flagellates. While bacteria and archaeal taxa have long been appreciated for their abilities to live in such extreme environments, surprisingly few studies have investigated the diversity of protists found in these unique habitats. Me + sampling gear at Devil’s Bath, a feature in the Waoitapu thermal field. Is this because protists can’t live in hotsprings? In short, no. While many geothermal sites have been widely studied most focus exclusively on bacteria and archaea. However, a few studies have shown that microbial eukaryotes can actively grow in most extreme environments, such as Spain’s super acidic River of Fire and on microbial hotspring mats in Iceland. While eukaryotes have a lower upper temperature threshold (<70°C for thermophilic fungi, although the precise cutoff is debated) than bacteria or archaea, we know protists are also present in hotsprings and play important ecological roles as well. Indeed, globally, protists are important as primary producers in ecosystems while others are predators, decomposers and parasites. 1) How does the diversity of microbial eukaryotes found in geothermal habitats change across environmental gradients? 2) How predictable are protist communities from environmental conditions and/or bacteria and archaea communities in geothermal systems? 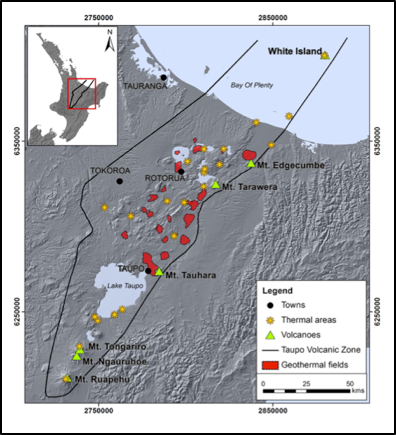 Geothermal fields (in red) in the Taupō Volcanic Zone (TVZ) in the north island of NZ. We are teaming up with scientists at GNS (a Crown Research Institute of New Zealand) and University of Waikato, who have sampled 1,000 (!!!!) 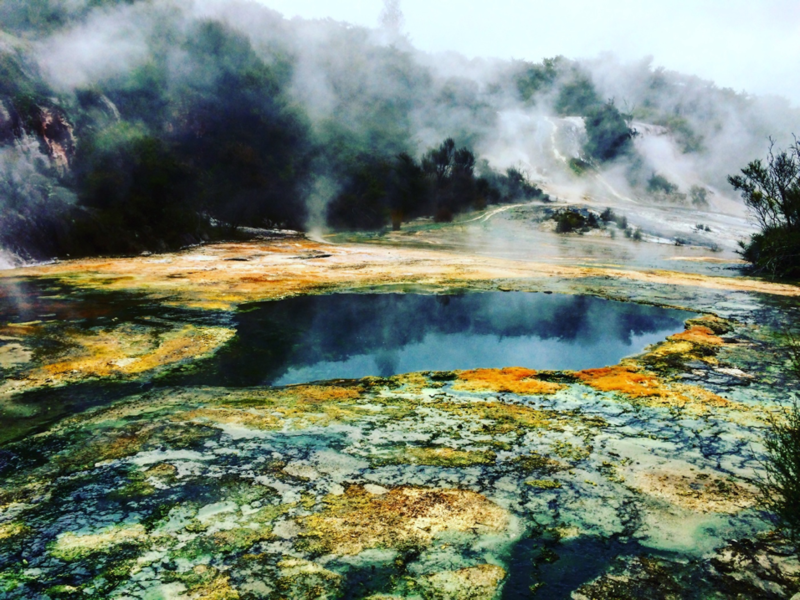 hot spring features in the Taupo Volcanic Zone (and check out more of their work here: http://1000springs.org.nz). After resampling just a few of these sites I especially realize what a feat this is. Many sites are dangerous and/or hard to access. The two biggest risks are falling in from stepping on unstable, crumbly ground – which there is a lot of— or going loopy and loosing one’s ability to think clearly due to the high concentration of noxious gases that can be in great concentration in the air around some of these sites. 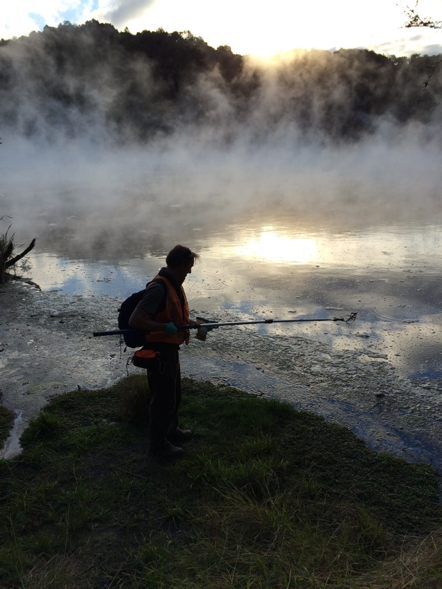 Matt Stott sampling Frying Pan Lake at Waimangu Volcanic Valley (one of the largest geothermal lake in the world!) – on the hunt for thermophilic amoebae. **Full-disclosure: I mostly stayed on the path and the hotspring experts Jean and Karen from Matt Stott’s lab at GNS helped a lot with the sampling. These 1,000 hotspring samples span the known pH and temperature range of the geothermal fields in NZ with temperatures from 13 – 110°C and pH gradient from 0 – 11. Since these environmental factors often vary independently across hotspring systems (i.e. pH and temperature are not correlated with one another), there is also a neat opportunity to use hot springs as ‘model systems’ to disentangle how different environmental factors shape the diversity and composition of communities. – Can we believe what we are finding was actually alive in the spring – particularly in the hot temperature samples? – What genetic material may be input from the surrounding environment versus autochthonous to the pool? – Do the sequence data miss any major groups and are they broadly consistent/representative? While these types of questions are important for any microbial ecology study, if we want to figure out what protists can survive in extreme conditions it is especially useful to get an idea of what types of euks may be commonly falling into pools or floating in a cooler temp biomass on top versus living in them. One approach is to do this bioinformatically, (which I am working on) but another validation is actually go looking for the microbial euks in the field and under the microscope! While this is bound to miss protists it is a good way to confirm that at least some of the taxa are visibly present. So far in New Zealand I’ve re-collected from a representative subsample of the sites for microscopy. I’m also amplifying the genomes of particularly interesting protists (generally those associated with pools that have cool or unique geochemistry) I’ve isolated, in hopes of relating the morphology and genetics/genomics back to the high throughput community level patterns. Hot springs can be incredibly dynamic. I went to the first few springs expecting the temperature and pH to generally be the same as when the sample was collected for high throughput data a year ago. I was wrong! While some of the springs were relatively stable, others had changed drastically and were completely different springs in terms of their geochemistry. When I was in the field with the temperature probe I also realized how often extreme temperatures are just millimeters away from much more mild temperatures. This sets up for some intense selective pressures and vastly different microhabitats. While for big pools it is pretty easy to get a sample that is pretty uniform, it is easy to see how for some of the smaller pools and streams multiple microhabitats may be captured in a single sample. While I didn’t think of using the ‘feature’ metadata (stream, pool, lake, terrace etc.) before I can see now how it might play a big role in what microbial communities a sample captures. Visiting field sites has been helpful as I think about how to analyze and interpret data. And for microscopy? I can happily report I’ve found protists. While I used to do light microscopy frequently, I haven’t in a few years… and I forgot how tricky it can be! Particularly to get a nice picture of a live ciliate (or maybe I’ve gotten slower). But I think I’ve managed to pick up some cool protists. We’ll see what the single cell genomics reveal! Lots of thermophilic amoebae around ‘Map of Africa’, a hotspring feature in the Orakei Korako geothermal field. If you want to see more pictures and videos of the hotsprings and protists I’ve found so far, head over here to my website. Thanks to the NSF EAPSI program and Lewis and Clark Scholars for providing funding for this project!